BUCKET LISTER!! LESS THAN 100 KNOWN!! $5 GOLD HALF EAGLE DUG!! 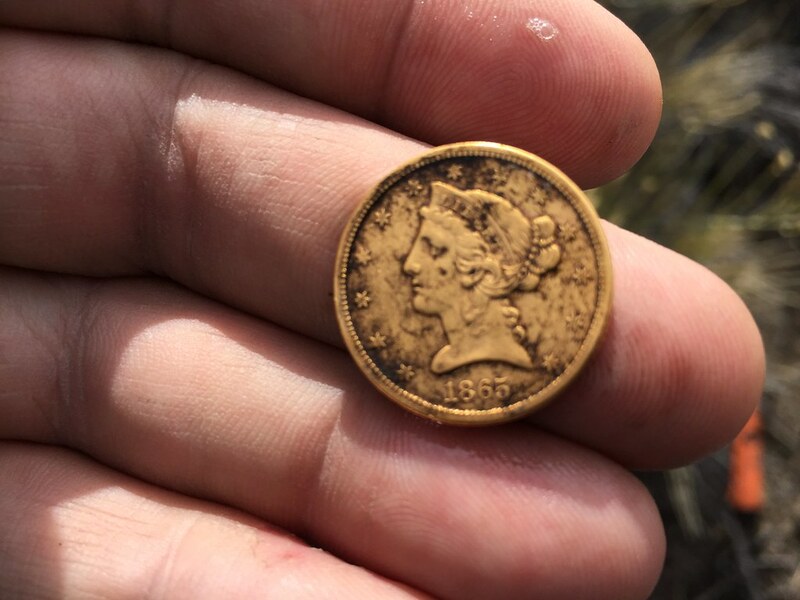 Tom(CA) and I have been working a site that we researched and it's produced several 1850's - 1860's seated coins, and some rogue early 1900's coins, as well as a variety of period relics. We tried to get one more trip in before Old Man Winter completely shut us down, and it did in fact shut us down, but not before I finally, got something I've been looking for for a long time, and after watching others find them over the years, I was starting to think it would never happen. Well it finally happened, and it turned out to be a good one, an 1865 San Francisco minted Liberty Half Eagle!! Detected this with my Nokta Impact. Although the mintage of the 1865-S is quite a bit higher than the mintages of the S Mint Half Eagles from 1858 to 1864, it compares in overall rarity to the 1858-S, 1860-S and 1863-S and is only slightly less rare than the others. Almost all known examples of this date are well worn with VF and lower being all one can expect to find. The 1865-S ranks second in the entire $5 series according to average grade and I do not know of a specimen that would grade better than EF. The very few specimens that I have seen were rather softly struck and the mintmark was always quite weak. Re: BUCKET LISTER!! LESS THAN 100 KNOWN!! 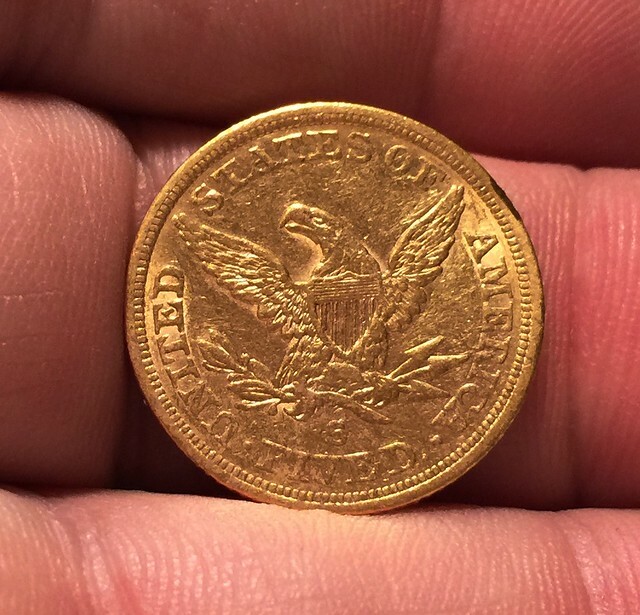 $5 GOLD HALF EAGLE DUG!! 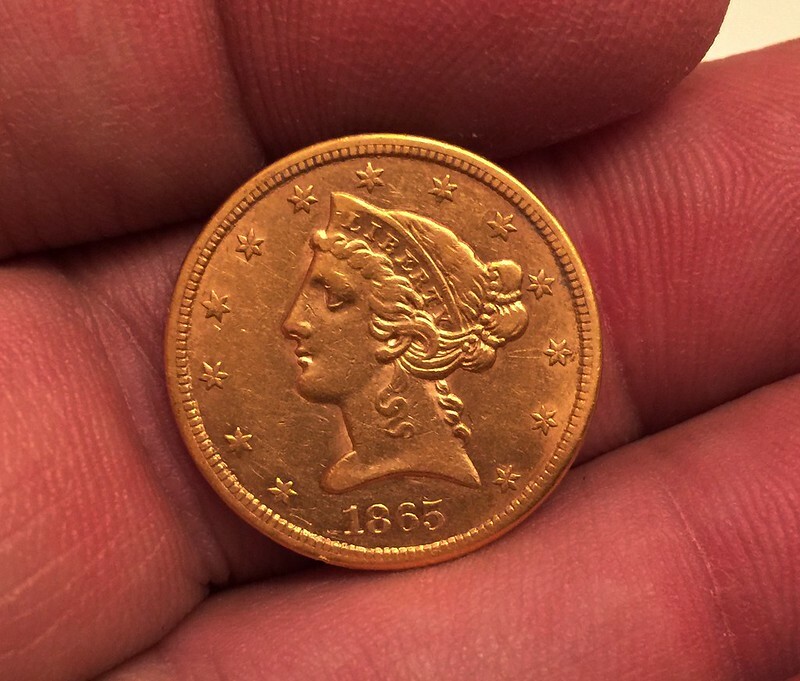 Finding a gold coin is probably on everyone's Bucket List, and they don't come easily (unless tour name is Tom and you live in California). I stated detecting in March of '65 but didn't get to check a gold coin off my list until I got a $2½ in 1978. It took me 13 years to hit that mark. And now, 40 years later come next summer, I still haven't plucked another gold coin, with all the time spent in ghost towns and other early-day activity sites, I keep coming up dry when it comes to gold coins. Good old times in California sure saw a lot of activity and much more exchange of gold coinage than many other states, and I envy the opportunities you have living down there with more potential. And now you've done it in a big way, too! Very nice find to help close out 2017. Way-to-Go!! Naturally, some complements also go to Nokta for providing us such great detectors to get the job done. Re: A huge CONGRATULATIONS !! God surely smiled upon you with this find. I haven't found my gold coin yet. Absolutely beautiful find. Well done in its recovery! I think I would have fainted. That surely ends the year with a serious bang. Congrats. What ID did it give you on the Impact ? Congrats Brian, WOW !!! what a coin. is the impact screen red or is it my eyes? What a great find that you will remember this find and right to the spot the rest of your life. A gold coin is the dream of many with only few that actually find one, I havent in my 45 years of detecting. I remember reading your Sovereign posts back in the day when I was using a Sovereign XS2a-Pro. Didn't you do a write-up on it using the WOT coil to clean out a particular park site?